So many of us have those spaces in our home that we intend to use for one purpose but, after time, end up being used for something else. Many times it’s short term storage, which after a while, has a tendency to nudge you down that slippery slope into catch-all storage. 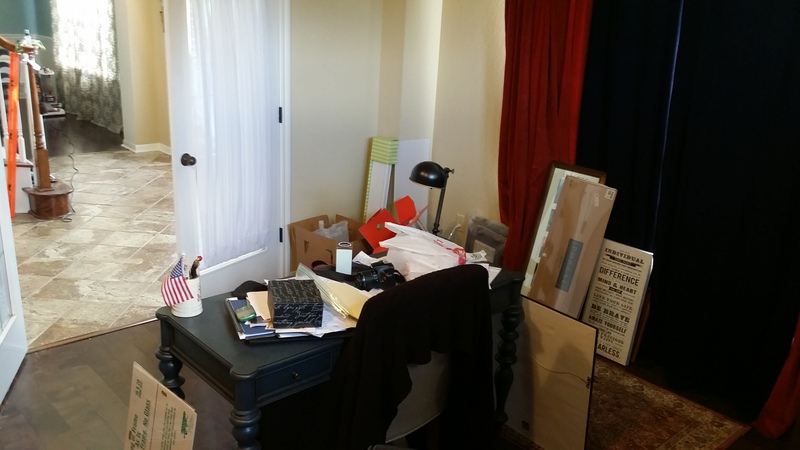 This homeowner’s front home office was due for a little dusting off and an organizational update. 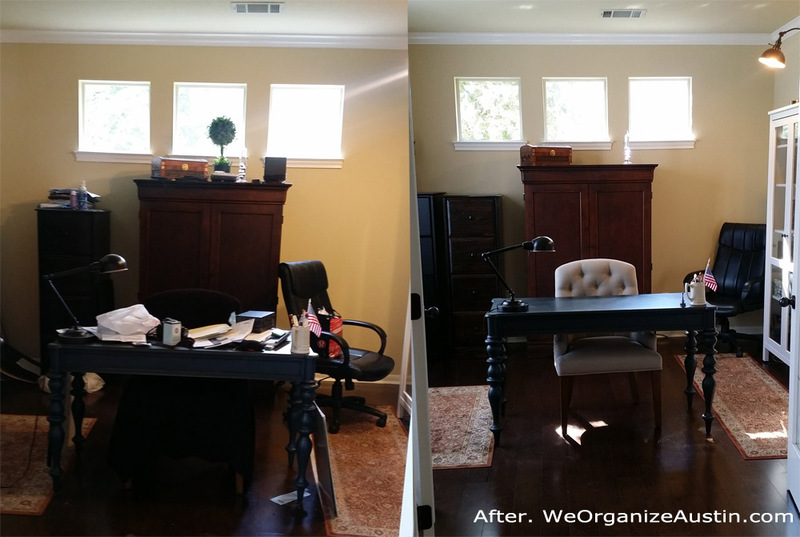 She had designed a beautiful, functional home office and after becoming a temporary (see: always longer than you’d like) storage area, it was time for a reset. In the entry way were two beautiful french doors. 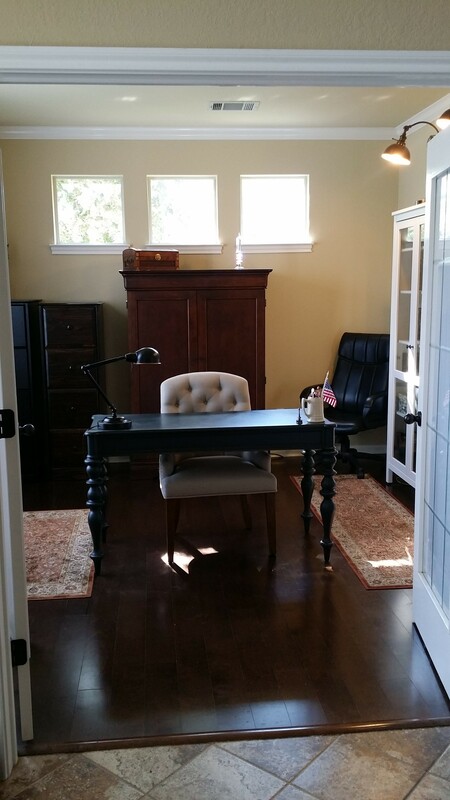 We opened them up into a dark, dusty home office. 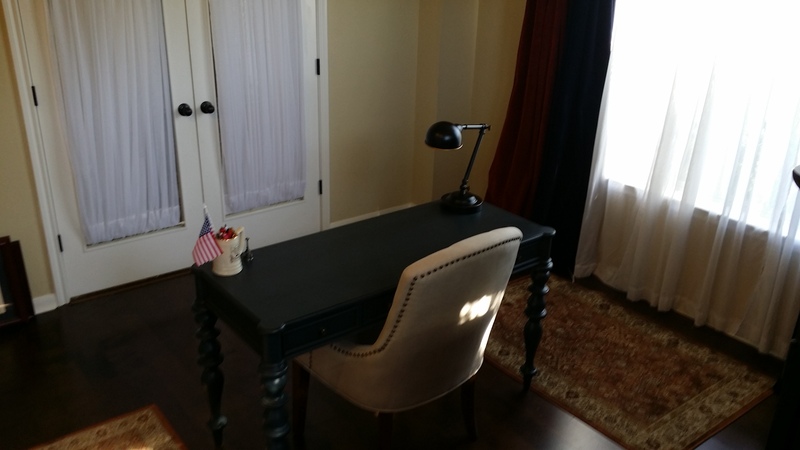 It had the cutest blue writing desk covered in paperwork, electronics, and random stuff that had a better home to go to. 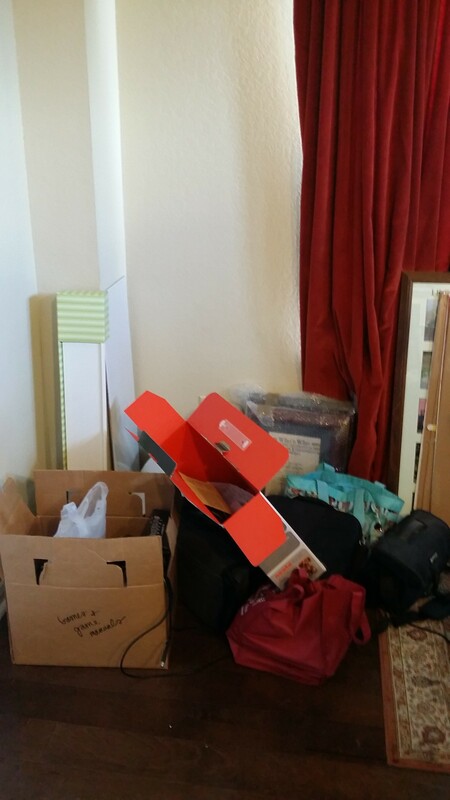 There was a corner of the room that held framed diplomas, boxes of video games, and decor. We started by opening the curtains and letting in a bunch of energizing sun. 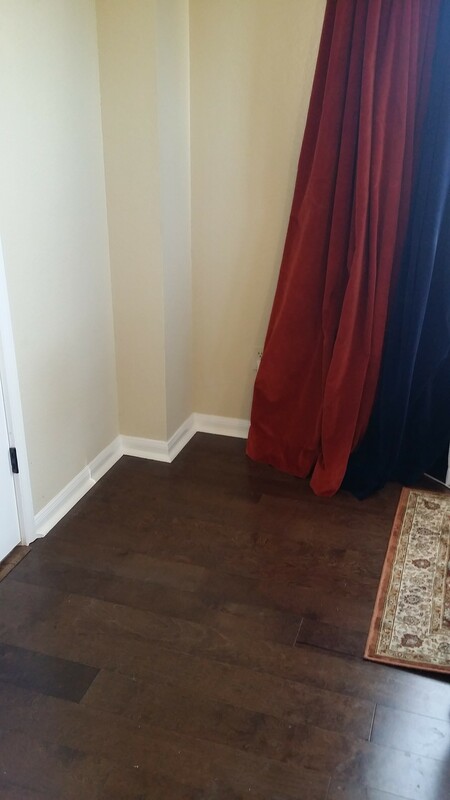 Next, we drug everything on the floor out into the foyer and making a pile of all the paperwork for the homeowner to go through. Beth and I grabbed her awesome Shark vacuum, a dust cloth, and went to town on the dust and floors while she sat down and sorted the paperwork into stacks of categories. Sorting is always the crazy part. In the middle of it you’ll have 20 stacks around you as well as a huge stack of papers in front of you. This homeowner powered-through it, though. She went through her folder categories, replaced some files, added new ones, and threw away old documents. Beth shredded a ton of old documents. If you don’t need it to refer back to for a legal reasons, odds are, you can probably do without it. Most companies and banks have online backup of information, if there’s a change you might need a document, you can usually request it from them instead of hanging onto a ton of paper waste. After the piles were formed, the homeowners moved in an empty filing cabinet in from their garage. 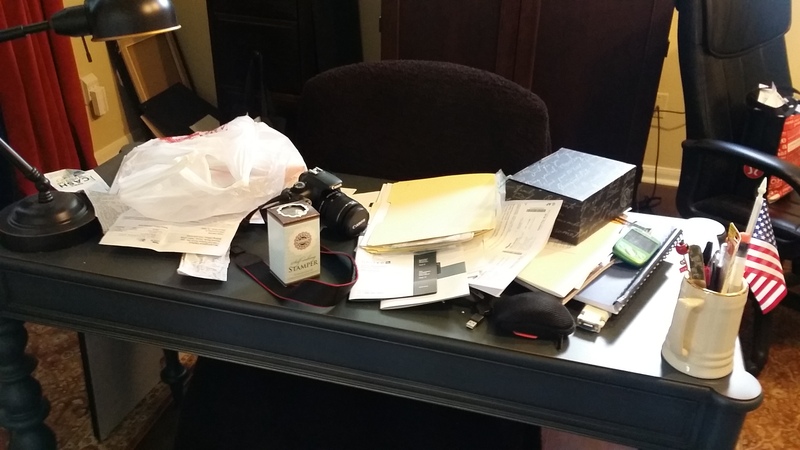 We used the filing cabinet for small office storage like papers, filing folders, small electronics and video games that had been previously hanging out in a cardboard box in the corner. This client was holding onto her dad’s old SLR Camera which happened to be broken. She admitted that she probably wasn’t going to use it so there was no bother in getting it fixed. She still wanted to hang onto it for the memory. We got rid of the storage case and displayed it as decor on her bookcase. Keep it if it’s useful or beautiful. If it’s beautiful, display it. 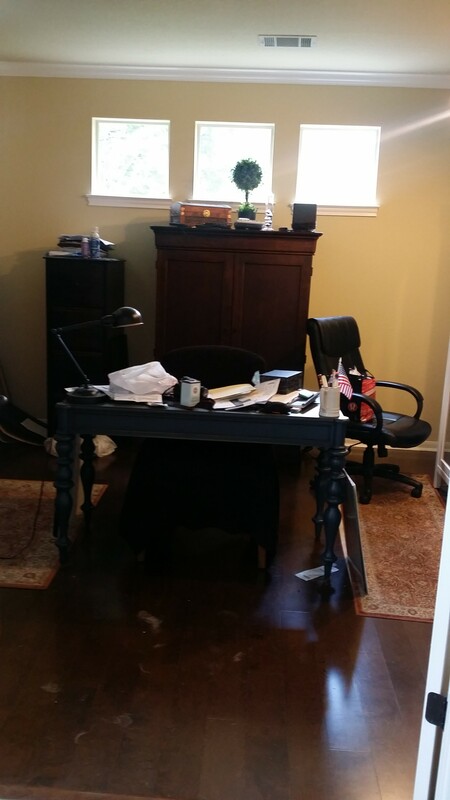 By the end of the session, all of the dust and doggie hair was gone, everything was in it’s useful home, and the french doors would now be an open addition to the home’s decorative feel. 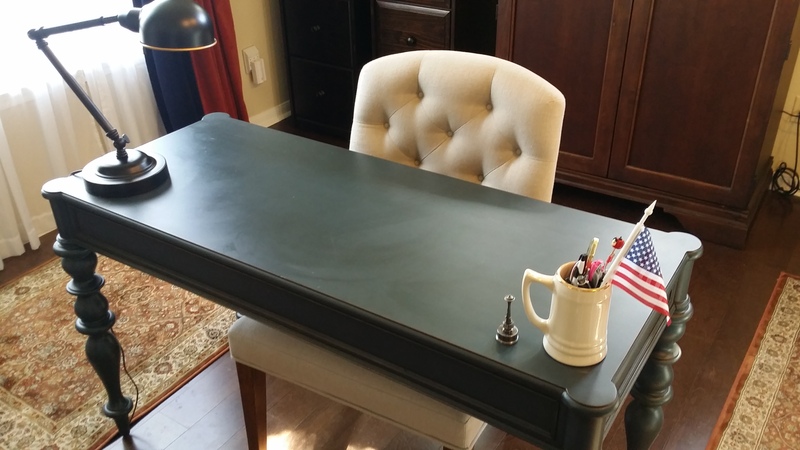 Posted on October 20, 2014 December 5, 2015 by shawnachildersPosted in Catch-all Spaces, Home OfficesTagged home office, home office storage, office, organize office, organized home office, organizing home office.